Where to Buy: East Pacific Tea Co. Delicious Formosan from the Taiwanese County of Nantao. This tea is tender on the taste buds with a slight scent of citrus on the nose. 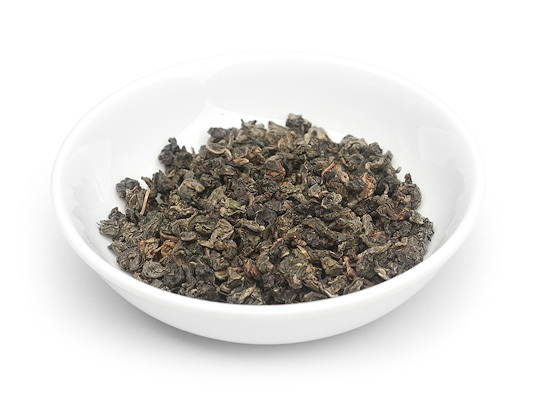 By speeding up the metabolism, this oolong tea is a great addition to any diet. My adoration of Oolong has been well documented by now with all the praises I sing of it here and elsewhere. This tea is the perfect illustration of why I love Oolong so much. The tiny green pellets are tightly rolled, and they are slow to open – bringing me many infusions of joy from just one measurement of leaves. The aroma that they release is slightly citrus and slightly vegetal, a bit like the scent you might experience after squeezing a bit of orange or lemon over asparagus. This fragrance translates very softly into the flavor – there is a definite citrus-y note to the flavor, however it is not so distinctive that I can tell you which citrus fruit I taste, exactly. Perhaps a medley of orange, tangerine and lime? There is a slight tartness, but overall, the flavor is decidedly that of sweet citrus. The body is smooth and silky – leaving a very pleasant feeling over the palate as I sip. Not quite as thick as some Oolongs I’ve experienced, but, very velvet-y, nonetheless. There is also a vegetative flavor to the cup. It isn’t a strong vegetable flavor nor is it grassy; it’s just a wee little hint at a vegetative quality. I prefer this tea hot, and that’s how I’d recommend that you drink it. Of course, you don’t have to take that recommendation, but you’d be missing out on the many subtle nuances of flavor that this tea has to offer if you don’t. The naturally sweet nature of this tea needs no additional sweetening, and I fear it would upset the lovely balance of flavors of this tea if sugar or something else sweet was added… however, if you’d like to emphasize the citrus tones of this tea, a teensy squeeze of orange might be am enjoyable addition. This tea is truly a Soul Vacation! It tastes so luxurious and it is positively relaxing to sip… and even to brew. Try brewing it in a glass vessel so that you can enjoy the showy display of the leaves slowly unfurling. Lovely! I have tried a few of their teas recently, Pure Nirvana and Soul Vacationwere my two favorite Oolong teas. I’m curious as to how their Black teas taste. Has anyone tried them?